Sanyotsuru is probably the hardest brewery to find in Saijo. 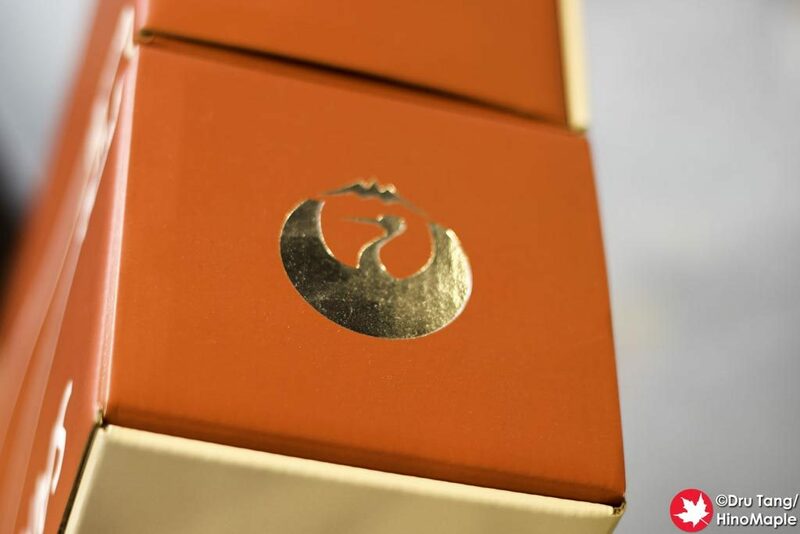 It isn’t that it is hidden, but it blends in very well to its surroundings that you just don’t know it exists. 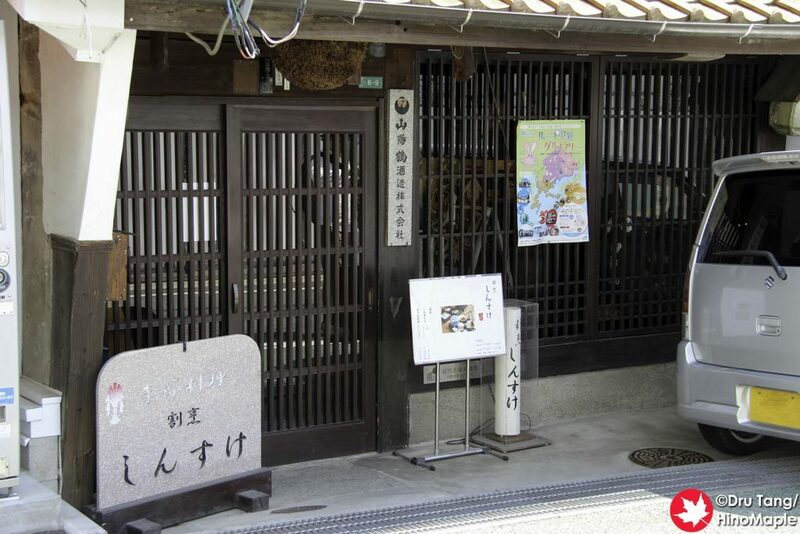 On the first day I was in Saijo, I visited a visitor’s centre and got a map of the area. I misread the map and headed down a side street where I saw a very old building that looked as if it was about to fall apart. It turned out to be the brewery! I ventured behind the brewery and gave up trying to look for the shop in the back. I looked on the main road and saw what had to be the brewery’s shop. The front had a rock sign for a restaurant and information that said the restaurant was open for lunch and dinner only. I arrived in the afternoon when the restaurant was on break. I saw the shop for Sanyotsuru but it was completely dark inside. The sandwich board to advertise the brewery was also inside. I chickened out and decided to return the next day when they may be open. The next day, I returned and it was exactly the same. The restaurant was open but the shop was completely dark. I decided to enter anyways and called out to see if anyone was there. A nice lady came out and welcomed us as she fiddled with the light switches before the lights came on. The entire shop was nice and inviting once the lights came on. The shop has almost everything all of the other bigger shops have, except it is a lot smaller. 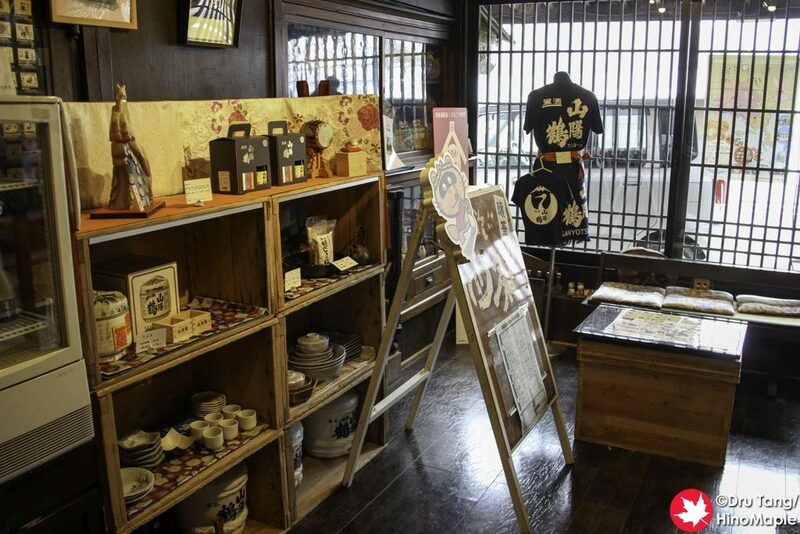 They have dishes, cups, masu, shirts, aprons, and so on. 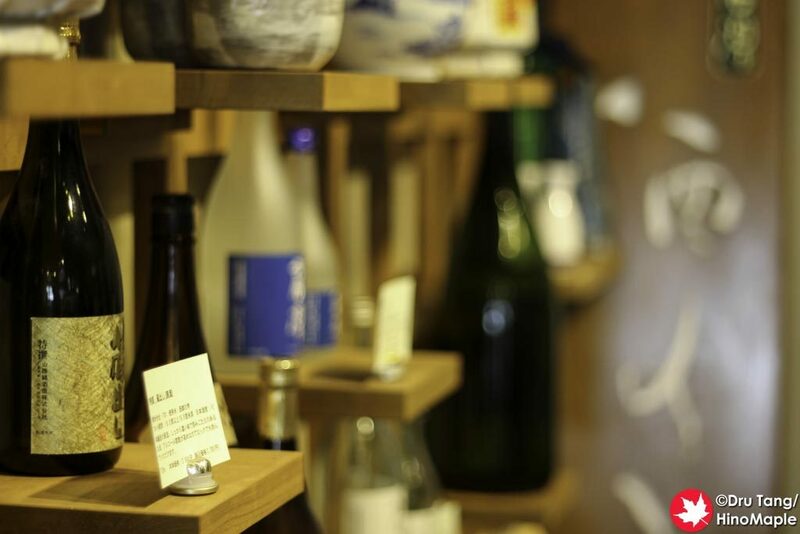 They have a great wall display showing all of their sake and everything is available for tastings! Trying the sake at Sanyotsuru is a very different experience to the other breweries. The rule is that you get one free cup before you have to pay. Each cup after the first one is 50JPY which is a lot cheaper than you expect. You get your own glass choko that is filled up. While it isn’t filled to the top, it is still a healthy sampling and well worth the 50 yen. In total, I had 4 cups and I had a great time there. When I was there, the person who helped me was a gem. At first I was wondering what kind of shop it was as she couldn’t find the lights, but once we started talking, I could tell she was passionate about sake, or at least Sanyotsuru. 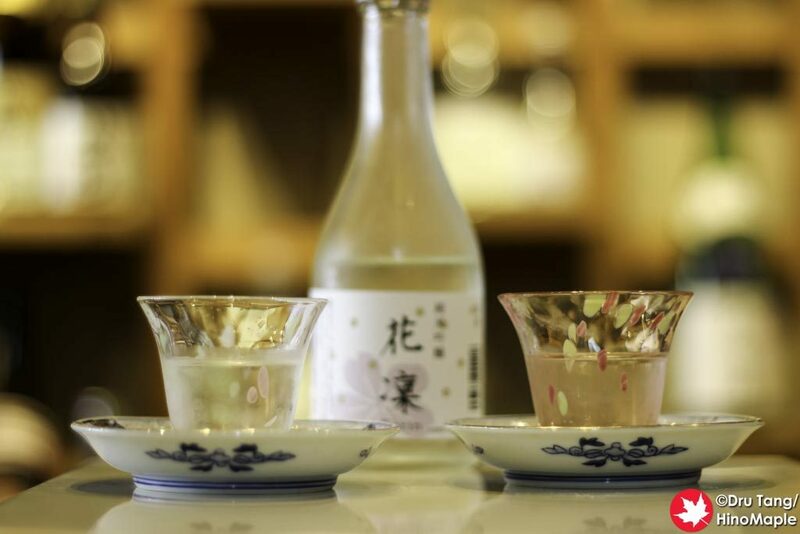 We talked about the different types of sake and what made them different. I sampled the Karin, a junmai ginjo that was made with sakura leaves. I was told that it wasn’t much different to the regular junmai ginjo, and it was cheaper. I had to pick up a bottle for myself. I also had their Sorin and Orizake. The Orizake is a nigorisake that is pretty good. It is a bit sweet but when you enjoy it cold it is delicious. Sanyotsuru is a great place to visit and I can’t recommend it enough. They are really friendly and informative. The only problem is that they are pretty hard to find. 2 years ago, when I first visited Saijo, I completely missed them. This time, I nearly did the same and on my second visit this time I finally got a chance to meet them. I’ll definitely be buying their sake in the future and I hope you get a chance to try it as well. Note: All links are to Sanyotsuru’s official pages. Sanyotsuru doesn’t have any English information. 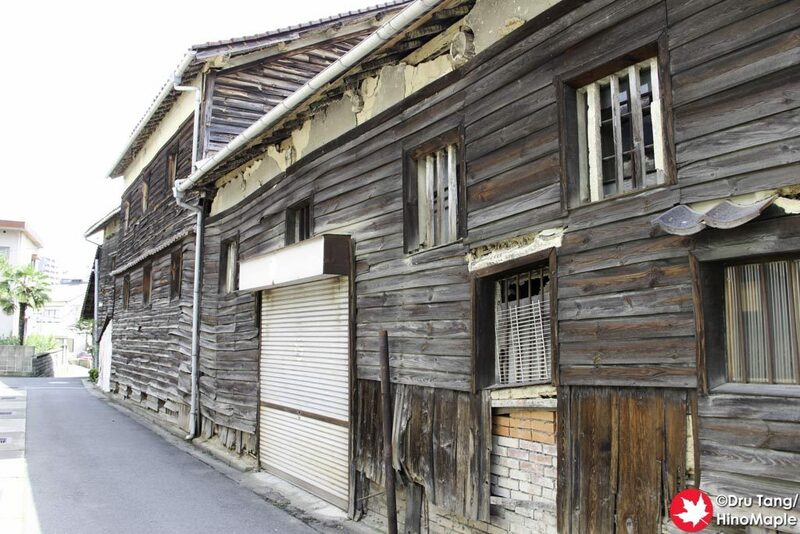 This entry was posted in Chugoku, Chugoku Food and tagged Higashi-Hiroshima, Hiroshima, japan, nihonshu, Saijo, Sakagura, sake, sake brewery, Sanyotsuru, Sanyotsuru Sakagura, Sanyotsuru Sake Brewery by Dru. Bookmark the permalink.